Los Angeles Housing Market Forecast 2017: Cooling Trend? Home prices in Los Angeles, California have risen steadily — and significantly — over the last couple of years. But that might begin to change in the months ahead. Recent forecasts for the Los Angeles housing market suggest that prices could rise more slowly in 2017, compared to this year and last. There has been a lot of talk lately that housing markets across California are reaching peak levels, in terms of affordability. As a result, market forecasts for 2017 are more conservative than in the past. This is true for the Los Angeles real estate market as well. Recent predictions and forecasts from housing analysts suggest that L.A. home prices will slow down in 2017. Take Zillow for example. The economists at the real estate information company recently predicted that Los Angeles home values will rise by a mere 1.7% over the next 12 months (through November 2017). That’s a much slower rate of appreciation than what we’ve seen during 2015 and 2016. This reflects the housing market forecasts being issued for many California cities. Across the Golden State, real estate markets are expected to cool down to some degree in 2017. Pick a city, any city, and chances are the 2017 home-price forecast is a fraction of the previous year’s gains. Will Slowing Home Prices Silence the “Bubble” Talk? The 2017 forecast for the Los Angeles housing market suggests that home values will rise more slowly over the next year. But that’s not necessarily a bad thing. In fact, it would ease concerns of a real estate price bubble. That was in December 2015, and home prices in Los Angeles have risen steadily since then. A continuation of those rapid gains could, in fact, lead to a bubble scenario. But it doesn’t appear likely at this point. If recent predictions for the the Los Angeles real estate market prove true, and prices do in fact slow down considerably, then it would give the market a chance to “normalize” and wages a chance to catch up. At the end of last year, mortgage industry analysts predicted that mortgage rates would rise steadily during 2016. They were wrong for the most part — until now. 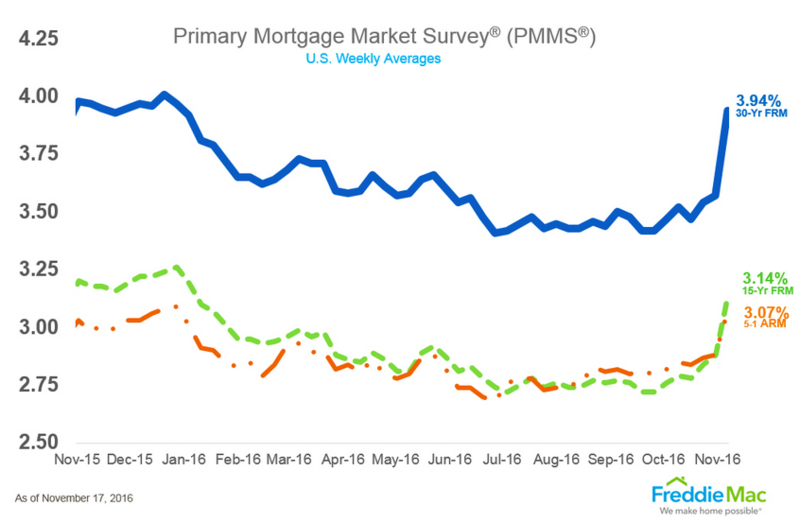 Thus far in November 2016, mortgage rates have been on a steady rise. Last week, the average rate for a 30-year fixed home loan shot up by nearly 40 basis points (0.40%). See chart below. Mortgage rate trends to date. Source: Freddie Mac. We expect the threat of rising rates to spur the Los Angeles housing market in 2017, particularly among home buyers. We will likely see a slowdown during the end-of-year holiday seasons, like always. But when the new calendars go onto the walls, a lot of L.A. home buyers will scramble to make their purchases before rates climb higher. We’ve been lulled by low mortgage rates for a long time. The latest spike, shown in the chart above, will serve as a wake-up call — and a call to action. Disclaimer: This story contains predictions and forecasts for the Los Angeles real estate market in 2017. Such statements were compiled from third-party sources not associated with our company. We have presented them here as a service to our readers. The Home Buying Institute makes no claims or assertions about future housing market conditions in Los Angeles or elsewhere.